The paper crumpler is a unique device designed to quickly and easily crumples paper for protective void fill . 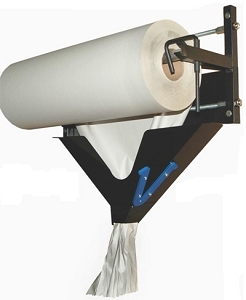 Works with all types of paper, including newsprint, indented paper, Kraft paper and heavy packing tissue paper. Roll wide capacity up to 24". All steel construction will have the Paper Crumpling device working year after year. A built-in cut-off blade providing clean, fast and effective packaging. The Paper Crumpler Dispenser can mount on packing stations or on a table top. This Patent Pending Crumpling Paper Device is Made in the USA. Ideally suited for making paper void fill. So economically, you'll want to buy Kraft paper crumpling dispensers for each packing station in your warehouse. Easily crumple paper for void fill and protective paper cushioning without the enormous expense of machinery. Very economical, the crumpler is the best most economical void fill dispenser available.